The locals in Peru call the meanest, nastiest ant of the jungle by the name “Isula”. We know it as the Bullet Ant. The Bullet Ant is known to be independent, tough, light on its feet, and an aggressive survivor – the IZULA-II knife is built the same way. 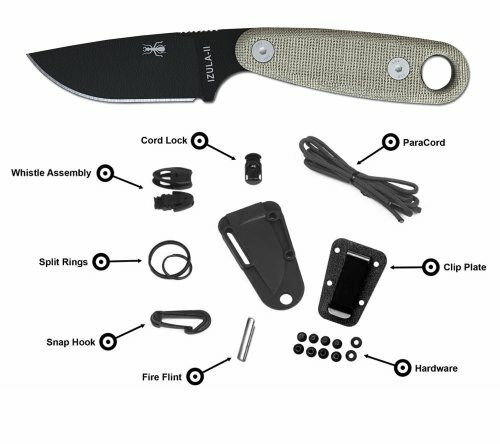 This knife is a perfect lightweight survival kit or concealed carry knife. This Izula-II measures in at 6.75″ of 1095 high carbon steel, the 2.63″ blade is flat ground with a black powder coat finish. The handle features a 1/2″ long notched section at the spine, for extra thumb grip. The handle of each knife is made out of comfortable Micarta scales, and the bottom of the blade is engraved with name, logo and unique serial number. Includes a durable black injection molded carry sheath. Comes with survival kit that includes: ParaCord, Cord Lock, Large Split Ring, Small Split Ring, Ferro Fire Starting Rod, Emergency Whistle, Plastic Snap Hook, and Clip Plate Kit. Carbon steel knives are preferred by those who want a sharp, long-lasting edge. With use, a carbon steel blade will develop a distintive dark finish. This is not a defect, but a natural result of the use of high-carbon steel. Carbon steel blades are not dishwasher safe, never let them sit in water for a long time, but rather hand-wash and dry your knives to avoid rusting.